The Scottish Independence Convention is a stakeholder organisation for all those who wish to see Scotland be an independent country. 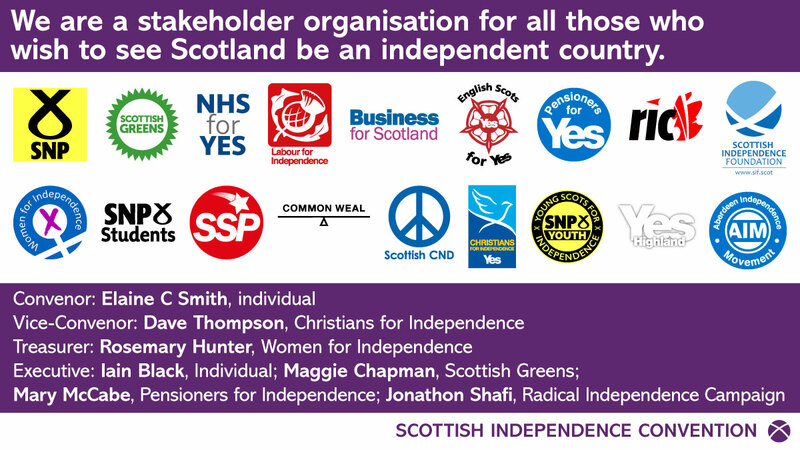 It brings together all the independence-supporting political parties (SNP, Scottish Greens, SSP), the national independence-supporting organisations (full list below) and representatives of local grassroots groups. Our work this year focuses on preparation for the next independence referendum campaign. Whilst there is much uncertainty about whether or not another referendum will take place, if one is called, we want to be ready to support the delivery of a successful campaign. We are very grateful to all those at Documenting Yes and to Stewart Bremner for allowing us to use their photographs and artwork. Please visit their pages and support their work if you can.